Contactless card payments have been the UK's sleeper hit in day-to-day tech this year. But with Christmas shopping season well and truly upon us, Barclaycard are providing a little wearable magic to speed things up even more with contactless payment gloves. Yep. 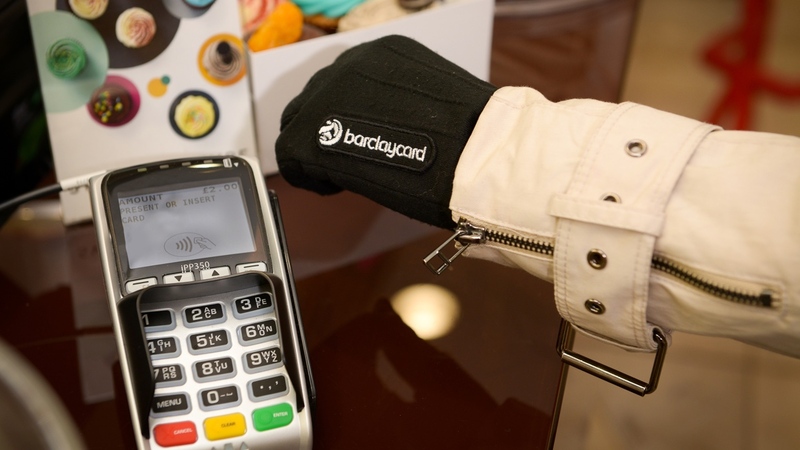 The prototype woollen gloves, which are of course emblazoned with the Barclaycard logo, contain its exciting bPay contactless chip. This can be linked to a credit or debit card and should turn up in plenty of third party wearable devices in 2015, including the Blocks modular smartwatch. The idea is to save shoppers seconds in the Christmas scrum as they don't have to even get their wallet or purse out to pay. They just tap the hand containing the bPay chip onto the contactless payment machine. The gloves are touchscreen-friendly too, for good measure. We're not sure the logistics yet such as how long it would take to try the gloves mid-shop. They are being trialled over "some" of Barclaycard's 300,000 contactless locations. "The ‘pay gloves’ we’re trialling are designed to let shoppers ‘tap, pay and go’ even when their hands are full of shopping. If the prototype is popular, these handy winter warmers could be bringing some festive cheer to bag-laden shoppers by Christmas 2015," said Mike Saunders, Director of Digital Consumer Payments at Barclaycard.